I always say inspiration can come from just about anything and in the case of this design board it was the new Eco Cross Baby Blanket by Spearmint Love. I am obsessed with this blanket and the fact that it comes in baby size and mommy size (Xmas list anyone?). Many of us are fans of the Pia Wallen cross blanket, but I love the fact that this Eco Cross Blanket is made in the US and was created by Spearmint Love! 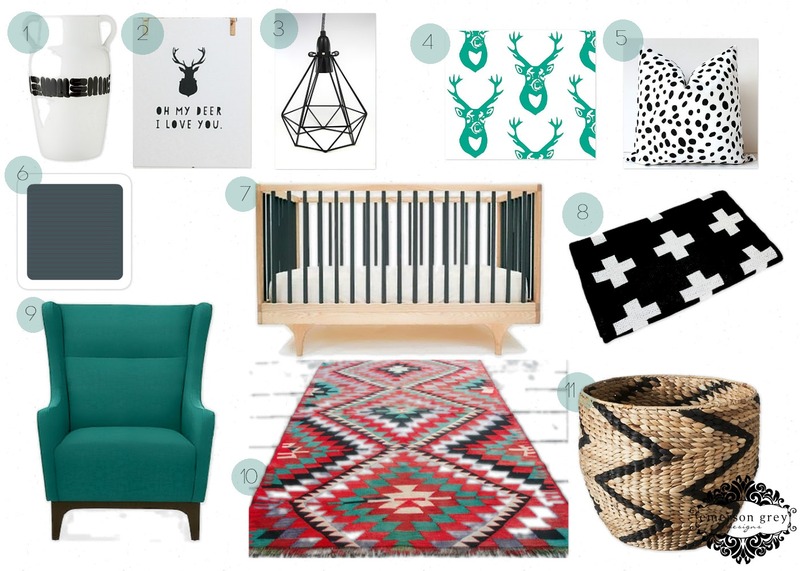 We all know how much I love black and white from the looks of my kids room but I wanted this nursery to have a bit of a pop of one other color. I thought teal would be a great color to choose not only because of the richness of this jewel tone, but also because if used in the right way it is easily a neutral color that can be used for a boy or a girl. I leaned a little more boy with this variation and I hope you enjoy it.